Through the Picture Tube is the story about Frank Walsh’s odyssey of discovery twenty years after the Vietnam war. Walsh is a middle-aged draft dodger whose only experience with the war is through the TV– the picture tube. Restless and depressed over the loss of his wife and haunted by the ghosts of the war, he impulsively decides to go to Vietnam to discover what really happened to his black-American school buddy, Darrel Johnson, who was the only American killed in the Bien Lai Massacre. As Walsh digs deeper into the past, he must also come to grips with a number of moral dilemmas raised by the Vietnam war– the horrific massacre of villagers at Bien Lai and his own troubled conscience for having taken the easy way out. Walsh’s odyssey begins in Hanoi where the author takes us on a visually captivating tour of the city–its sites, architecture, people, peculiarities and culinary delights. The adventure doesn’t end there. Walsh transports us into the countryside on a fascinating, fast-paced tour of present-day Vietnam. Suspense and romance are added features that propel the novel to its final surprising climax. Patrick Grady was a American draft dodger who was opposed to the Vietnam War and lived in Canada for 44 years. He fled to Canada from Danville Illinois in 1968. His experiences were chronicled in James Dickerson’s book North to Canada; Men and Women Against the Vietnam War. Grady earned a Ph.D. in economics from the University of Toronto. Currently he is the president of Global Economic Ltd., an Ottawa-based consulting firm. He is the author of several books about economics and social issues and frequently contributes articles to newspapers. Through the Picture Tube was inspired by a trip he made to Vietnam to carry out a study of the Vietnamese transition from a centrally planned to a more market-oriented economy. 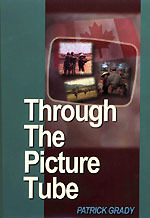 THROUGH THE PICTURE TUBE is available from Amazon.com and Amazon.ca. and for Kindle on Amazon.com and for Nook at Barnes and Noble. Read Chapter 1 of THROUGH THE PICTURE TUBE.